After 2 years of planning and 1 year of saving, hours of personal rehearsal and 2 major rehearsals and 3 meet and greets, we finally got on the road on the 11th of April with a 100 man choir, 3 man band and 1 choir director. Must’ve done well in maths at school. This was going to be the longest single on the road experience I had so far and with my dear wife Catherine in tow, who by the way sings too. Met her in a choir years ago and proposed to her after one of the rehearsals 🙂 . 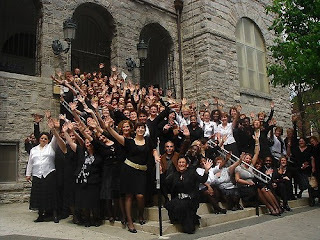 Here we were on this tour with the Friendship Gospel choir from the Netherlands where we are based. Were we glad to finally see outside the airport and place our baggage in the tour buses . There were 2 of them and the drivers were very friendly and professional, both floridians . 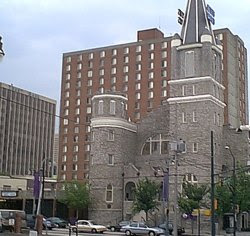 From there straight to our hotel The Holiday inn Atlanta downtown (The 1st of 3 in the 2 weeks) . The location was great as major attractions were within walking distance; Georgia International Convention Center, CNN Center, Centennial Olympic Park , World of Coca-Cola, the Georgia Dome and the newly opened Georgia Aquarium. We came here to sing okay not for vacation, I had to remind myself and my dear wife. We had a joint welcome dinner that evening to settle in together with the group and pass out important information. From the next day, it was work bar a one free day. Atlanta segment: We only got to do 2 of the 3 planned stops in Atlanta. The first was the Big Bethel AME Church . This is a church that has existed since the 1800 as an African american church and It was a blessing to be there and soak up the anointed atmosphere. We had a workshop on the saturday (12) with Edith Castelyn (our choir director) teaching some songs in a workshop and the loacl Minister of Music Re. Vernon Jones teaching us some songs as well. We ended up being the choir for the day in the service and singing even onrehearsed songs . One wierd thing though is that we were requested to sing Great is thy faithfulness in the Dutch language which we obliged (never dreamed that will happen) Must have been exotic to the listener hearing Groot is uw trouw O heer, conducted by their music minister who didn’t understand a word , but hey, music is a UNIVERSAL language right ?! Wow! When the service started, I was in a dream world. For those not used to services, It was similar to what you could see on films as Fighting temptations, the blues brothers (without the acrobatics) , the diary of an angry black woman et.c But that does not prepare you for the live experience. I must say it was one I’ll cherish for ever. It was an honour (honor (American)) to be able to sing in such a service with so much history . 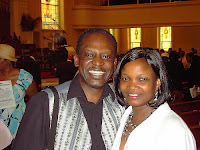 The song Total praise ( Richard smallwood) soared and was heavenly. Glorious. We were able to minister 2 of our songs : Just having church (Chester baldwin) and Lord we magnify your name ( Luther Barnes) and they were well received. I gathered later, comments among some congregants (those white folks can sang ) Now, that’s a great compliment with our 90 % white membership from the Netherlands ! The church showed great hospitality and provideded lunch not only after the rehearsal the previous day, but also on the sunday. Then, we got to tour the City of Atlanta in tourist mode. Our 2nd stop at Calvary Baptist church did not happen due to communication and confirmation issues 🙁 but we rested and in the evening, met again to go over the days experience. Many wiped a tear from the emotions of such an encounter with the african american church and I believe a touch of their hearts. This set the scene for the rest of the tour.